A rough rule of thumb is that the more of us there are, the less other wild living things there will be: an inverse correlation. Actually, more than an inverse correlation: sheer cause-and-effect. Wildlife – wild flora and fauna – compete directly with humans for limited space (or ecological niches) and resources. Our rise necessitates their fall. In fact, ecologist Vaclav Smil of the University of Manitoba has shown that Homo sapiens plus our handful of domestic animals – which we permit to exist only to feed or pleasure us – now comprise more than 95 percent of all the mammalian biomass on Earth. was slaughtered almost to the point of extinction in the 19th century. In this human-induced, human-dominated Anthropocene Epoch, the synergistic combination of our exponentially increasing population and consumption is unleashing a Sixth Great Extinction – a catastrophic loss of life and biodiversity not seen since an asteroid slammed into our planet some 65 million years ago, ending the Cretaceous Period and wiping out the dinosaurs. The gargantuan impact of human beings on the biosphere of the only planet that we know for sure sustains life in a cold cosmos now rivals the great geologic forces that shape Planet Earth; and if we can now be compared to asteroid strikes, we might even appear to be approaching not just geologic but astronomical levels of impact. It was not on a whim that Professor William R. Catton, Jr., author of the classic Overshoot: The Ecological Basis of Revolutionary Change, quipped that while our species’ official scientific name may be Homo sapiens, unofficially we should be dubbed Homo colossus. With this dire situation as a background, today, May 19, the U.S. Fish and Wildlife Service – the federal government’s premier agency responsible for conserving wildlife and biodiversity – is observing Endangered Species Day in order to raise awareness of the concerted conservation efforts taking place nationwide to protect America’s endangered species and their habitats. The Fish and Wildlife Service reminds us that while countless species have appeared and disappeared since life began on Earth many hundreds of millions of years ago – succumbing to extinction by naturally occurring physical and biological conditions – the present rate of species loss is much higher than the “background” or natural rate of the past. In fact, some experts estimate that today’s human-influenced extinction rate may be a thousand times higher than the background extinction rate of the recent geologic past. 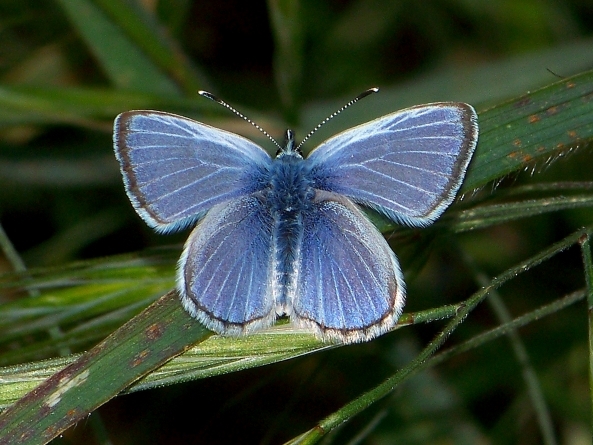 The Palos Verde Blue Butterfly in Southern California is endangered because of habitat loss to development linked to population growth. In the U.S. alone, biologists estimate that since the colonial era, more than 500 species, subspecies and varieties of our plants and animals have been driven extinct, each and every one by human agency (not natural causes). It is not a coincidence that this extensive species loss occurred at the same time that the U.S. population was growing from just a few million settlers to 325 million today. along California’s coast that has been disappearing under development. To support this massive population increase, it was necessary to modify the natural environment on a vast scale. Natural habitats were converted en masse to agriculture, urban and other uses. Forests were cut down to provide fuel, farmland, construction material and paper. 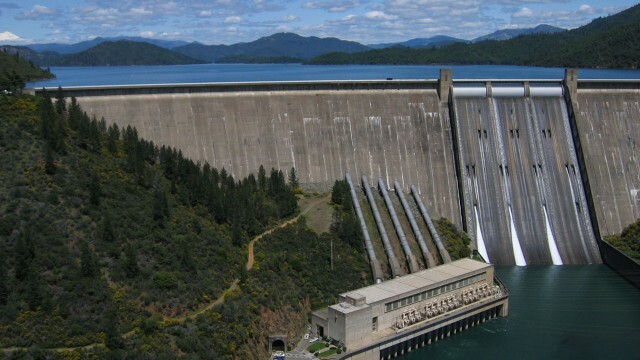 Rivers were dammed for electricity, to supply water, and control floods, adversely affecting aquatic life such as fish, clams and mussels. We introduced exotic and invasive species intentionally or inadvertently. We poisoned the air, ground and water by spraying pesticides and emitting other toxins and contaminants from smokestacks, chimneys and tailpipes. Sewage and other effluents poured into and polluted water bodies. Early on, we persecuted fearsome predators such as wolves, bears and mountain lions, while we slaughtered edible animals like bison, deer, pigeons, ducks and geese with abandon. Today, at least in America, this wanton slaughter has been halted, but now it has metastasized over much of the developing world, threatening magnificent creatures like the elephant, giraffe, tiger, snow leopard and rhinoceros with permanent oblivion. Congress reacted to concern that many of America’s indigenous plants and animals were in danger of extinction by passing the landmark Endangered Species Act in 1973, jointly administered by the Fish and Wildlife Service and the National Marine Fisheries Service. Its purpose is to protect and recover threatened and endangered species, as well as to conserve and manage the habitats upon which these species depend. The Fish and Wildlife Service has primary responsibility for terrestrial and freshwater organisms, while the National Marine Fisheries Service is mainly responsible for marine wildlife such as whales and anadromous fish like salmon. hydrology of rivers and thus the aquatic species that live in those rivers. Recovering species listed as threatened or endangered is a complex and difficult task. We are trying to stop and reverse declines that have sometimes been in the making for decades or even centuries. It takes time, effort, commitment, cooperation and funds. Many species are imperiled from more than one kind of threat, such as habitat loss and degradation through resource extraction and development, invasive species proliferation and contamination. 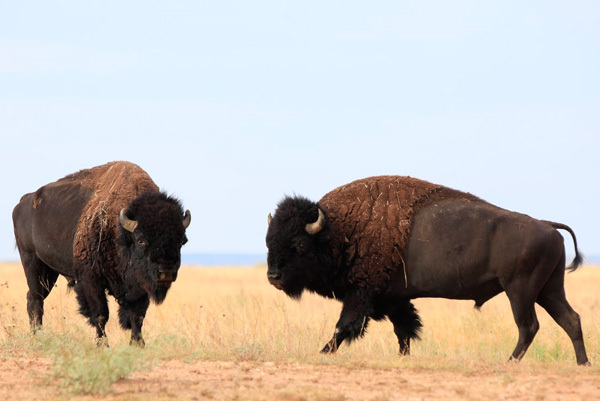 While hundreds of species remain threatened or endangered, there have been remarkable success stories as well, including the bald eagle, osprey, gray whale, California condor, whooping crane, bison, brown pelican, peregrine falcon and many more. The Fish and Wildlife Service lists a number of things Americans can do to help. But the Service leaves out perhaps the most obvious one: support U.S. population stabilization. If the U.S. population continues to grow at the rate it has in recent decades, up to 30 million or more per decade, no amount of intensified management and wishful thinking will prevent additional extinctions. Before we can mop up the floor, first we have to turn off the spigot.